Ten-hut. Here comes the last -- and the soapiest -- of this fall’s gung-ho, special ops military dramas. Judging by the early ratings returns, NBC’s The Brave already is looking like it might be an aborted mission while CBS’ SEAL Team could be marching toward longevity on the sturdy shoulders of David Boreanaz, the Gen X equivalent of Mark Harmon. Valor, firing up Monday, Oct. 9th on The CW, has younger, prettier people and more “drama” on the domestic front in addition to its exploits overseas. As did SEAL Team, it starts with a Middle East operation gone wrong -- and then keeps flashing back to it. 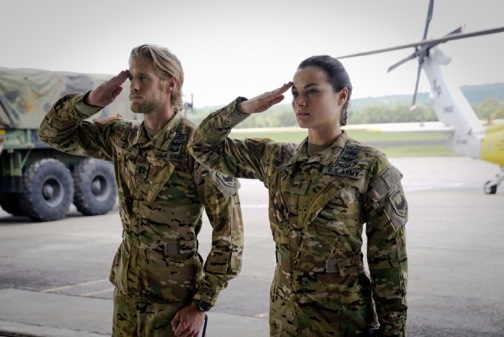 Valor’s two featured warriors, Warrant Officer Nora Madani (Christina Ochoa) and her commanding officer, Capt. Leland Gallo (Matt Barr), are both members of the elite Shadow Raiders helicopter squad. They’ve conspired to make up a cover story after returning home without one of their own, Jimmy Kam (W. Tre Davis), whose whereabouts remain unknown until revealed later in the opening episode. Meanwhile, his wife, Jess (Corbin Reid), and their seven-year-old son are left in limbo. Madani also is still recovering from a leg wound suffered on the mission, but has returned to duty a month later in still unstable condition. Home base is Fort McPherson, GA.
Alas, Madani and Gallo must then re-regiment themselves and be decorated with Distinguished Flying Cross medals for their bravery in Somalia. No Hooahs this time. Both she and he might want to act on that impulse in future episodes because, well, things get pretty heated between Madani and Gallo after she takes his advice to release tensions by whacking holes into a wall with a metal rod. Madani also has a newly purchased drum kit at home to let off steam, and soon is pounding the skins. This all probably sounds ridiculous, and pretty much is. Even so, Valor is more entertaining and accessible in its own way than network TV’s two other hard-charging combat hours. Ochoa and Barr blast off in their lead roles and also play well together. And the series’ serial elements, both combat- and romance-wise, are intriguing and very much unresolved at the end of the first episode. The CW hasn’t offered anything beyond the pilot for review, leaving an urge to come back for more revelations while also reveling in Valor’s steamy out-of-uniform activities. So it’s forward march and half a hooah from me -- at least for another hour or two.